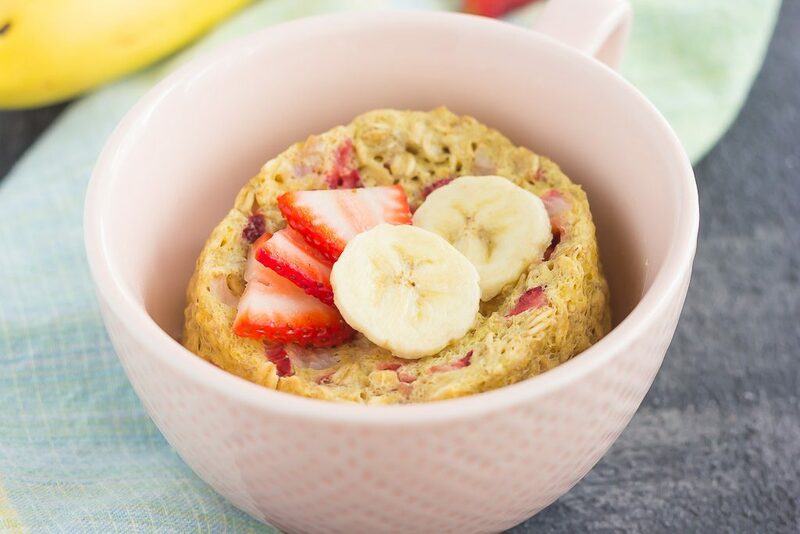 This Strawberry Banana Baked Oatmeal in a Mug is perfect for those busy mornings for when you want a quick and easy breakfast. 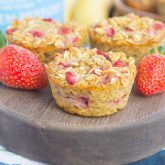 Packed with hearty oats, fresh fruit and made in the microwave, you can have this baked oatmeal ready in less than five minutes! As I’m typing this post, I’m listening to Spotify. Why, oh why, did it take me so long to try Spotify? I loooove it! I was using Pandora before, but I’m officially hooked on Spotify. It keeps me company when I’m recipe testing in the kitchen or working on other blog tasks at my computer. And I’m a 90s girl all the way. It’s my first play list of choice, followed by the 00s. And speaking of 90s, Mambo No. 5 just came on. I’m totally showing my age here, but this song was popular when I was in high school…oh, the memories! You just can’t help but dance when that song comes on, as cheesy as it is! Anyways, I’ll get off my soapbox now and get right to the recipe. Because that’s what you’re really here for, right? It’s the fourth installment of our Meal for One series! I hope you’re enjoying it so far, because I sure am. It challenges me (in a good way!) to create more recipes for just one serving. To see the past three recipes in the series, you can check out this link! 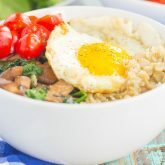 And today, I’m sharing one of my favorite oatmeal recipes with you! If you love baked oatmeal, then this single serve recipe was made for you. A hot and easy breakfast ready in less than five minutes? You got it, friends! If you’ve been following me long enough, you know that I’m a big fan of baked oatmeal (see this banana bread version and that pumpkin pie version). So, I took on the challenge to make an easier, microwavable version that’s the perfect amount for just one person! 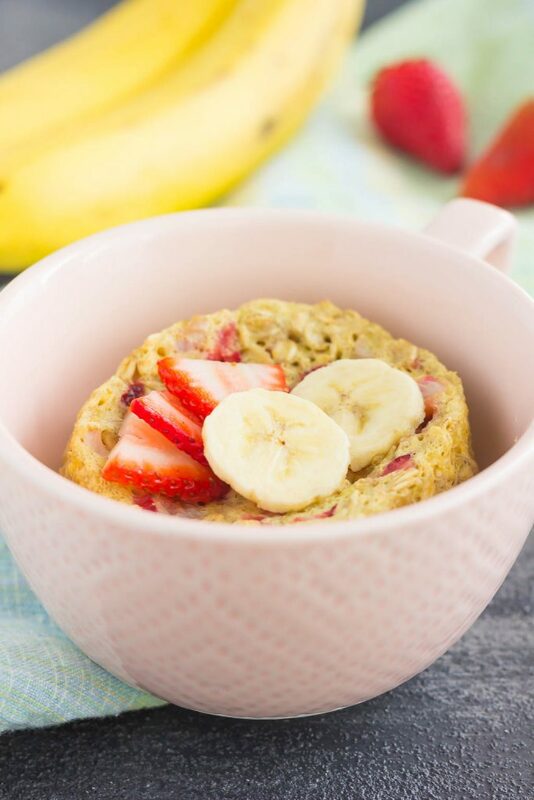 This Strawberry Banana Baked Oatmeal in a Mug is packed with flavor. 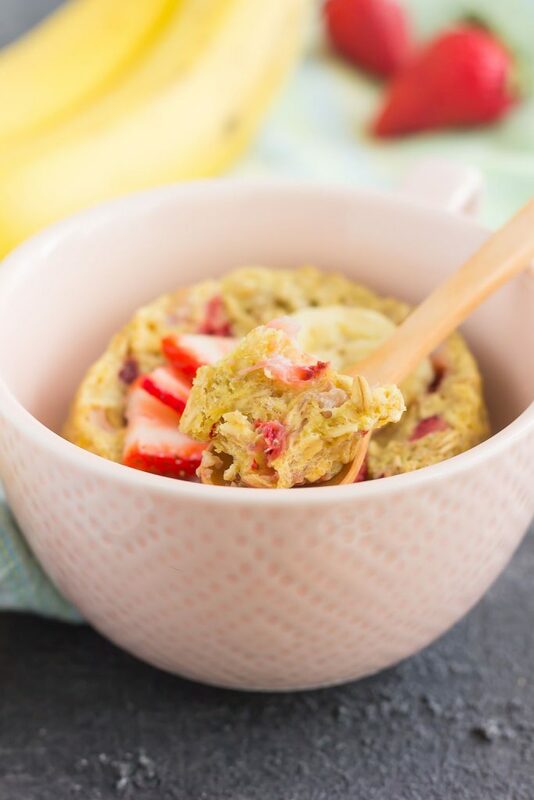 From the hearty oats, sweet banana and fresh strawberries, you’ll love the convenience (and sweet taste) of a hot breakfast, made right in your microwave. 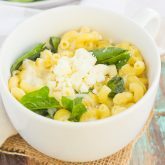 You can mix everything together in a microwavable mug or bowl, and then just pop it in the microwave. Within minutes, your deliciously warm oatmeal is waiting to be devoured. How about that for a Meal for One breakfast? So if you’re cooking for one, this baked oatmeal is the perfect solution for when you want a hot breakfast, without all of the prep work. It’s simple, fast, and full of flavor. And fun to make, too! Coat a large, microwavable mug or small bowl with cooking spray. Add oats, sugar, baking powder, and salt to mug. Stir to combine. Add banana, egg, milk, and vanilla extract to oats. Stir until mixed in. Microwave on medium power for 3-3 1/2 minutes, or until center is mostly set. Let stand in microwave for one minute. This baked oatmeal is not overly sweet. If you would like a sweeter taste, increase the amount of sugar by 1/2 teaspoon. Alternatively, you can sweeten the oatmeal with honey or maple syrup, if desired. 90s songs are the best! So many great ones. Thanks for the oatmeal love, Dawn! This sounds so good Gayle, I love baked oatmeal too! I need to make them more often! Thanks, Manali! Baked oatmeal is a favorite of mine! Haha I love Spotify and am a total 90's music girl too :) Oatmeal is my favorite way to start the morning and this baked oatmeal for one is genius, Gayle! It's SO pretty and the strawberry banana combo sounds perfect! Isn't Spotify the best? I'm hooked! :) Thanks, Kelly! I've never listened to Spotify and need to give that a try! 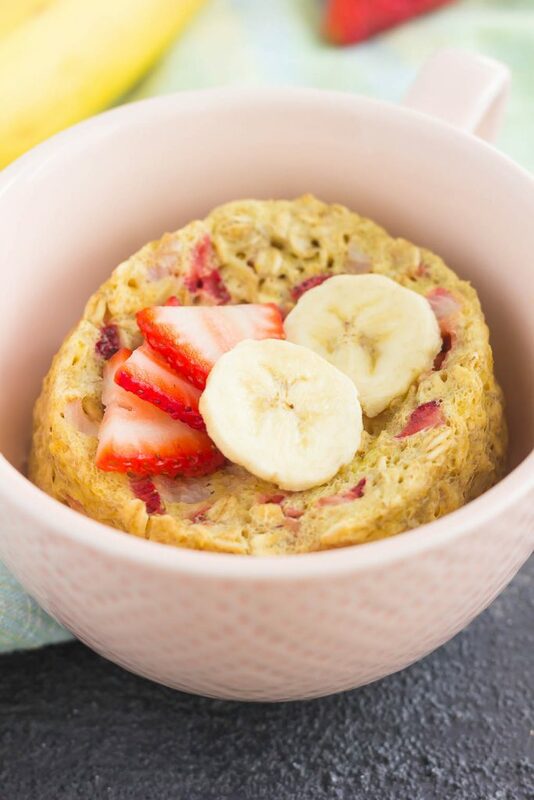 I love that you made baked oatmeal into a quick and easy mug recipe with no oven required! Just genius, and the strawberry banana combo is one of my favorites. I will definitely be trying this! Spotify is perfect for just about any type of music you can think of...I think you'll love it, Marcie! Thanks for the oatmeal love! Hahaha Mambo #5 brings back such memories. So funny! For some reason, I stopped listening to Spotify when iTunes came out with their offering; listening to the new Shakira now! 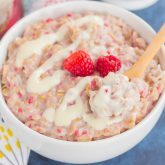 Strawberry banana is pretty much my favorite flavor combo and this oatmeal is the prettiest ever! I need to check out iTunes again too...I always forget about that! Thanks for the oatmeal love, Sues! This is just what I need when I don't have much time in the morning but want a hot breakfast! I'll be trying this soon! Thanks, Jessica! It's definitely perfect for those busy mornings! Yes! Doesn't music just keep you sane through ALL the blog work? :) Thanks for the sweet comment, friend! Oh this is perfect for breakfast because there is no such thing as a quiet morning in my home, it is always busy and rushed,just grabbing a slice of toast or a cup of coffee. This is so quick and easy, so no more excuses for leaving home without breakfast. Great recipe, I love it....definitely saving and pinning.???? Thanks so much for the sweet comment and for stopping by, Ashika! Hope you love this if you try it! Oh I've got to go Costco and load up on strawberries! :) Thanks for the oatmeal love, Blair! Yess I love Pandora and Spotify! It is a rare moment that one of them is not playing music in my house. It's too quiet otherwise! This baked oatmeal looks delicious, Gayle. And I love that it's single serving! Yay for spotify! Thanks for the oatmeal love, Annie! Hi Vera! I'm so glad you and your father liked this! It's one of my favorite, easy breakfasts. Thanks so much for stopping by and letting me know how it turned out!